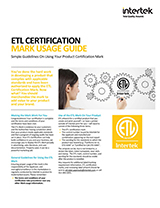 Today, the ETL Mark is the fastest growing safety certification in North America and is featured on millions of products sold by major retailers and distributors every day. Browse through our most Frequently Asked Questions about the ETL Listed Mark. Check out our white paper The Essential Guide to Product Testing & Certification for more information on the standards we test to for the North American market. Intertek is one of the world's largest Testing, Inspection and Certification companies. We have a network of laboratories across North and South America, Europe and Asia to deliver safety testing and certification for your products. Our teams around the world provide Global Expertise with Local Service. No one partners with manufacturers better than Intertek to deliver the services you need, when you need them, and where you need them. Resolution from Mexican Government recognizes ETL as Equivalent to NOM Certification for three NOM Standards. AHJs can learn more about our accreditations, certification marks, and public safety notices by visiting our dedicated Inspector Information Center. Or check out our "Partnership in Safety" website to learn more about how we work with inspectors and code officials to help keep people safe where they live, work and play.